I wrote back to say; “Hello Edit, There are two ways to get to Gibraltar by bus. The first option I have set out is to travel from the airport to Malaga bus station, this is the service which leaves every 30 minutes and then take a bus all the way to La Linea bus station right on the frontier of Gibraltar. The second option is to take the airport bus to Marbella bus station and then another bus from there to La Linea. Option 1: If you look at the link below you will see that the last bus of the day from Malaga bus station to La Linea on the border with Gibraltar is at 17.15. If you take a taxi from Malaga airport to Malaga bus station (€20) you might just make the last bus to La Linea but if your plane is late and you have to wait for luggage, you won’t get there in time for the 17.15 bus leaving Malaga bus station for La Linea. Check through here to find the timetable of all buses leaving Malaga Bus Station. If you are travelling on a Sunday then there is no hurry because the last bus to La Linea leaves at 19.15 and you can catch the L19 bus from the airport to Malaga bus station. There are two buses from the airport to Malaga bus station every hour and the L19 bus leaves from just outside the arrivals area. Option 2: The other alternative is to take the special bus from Malaga airport bus to Marbella. Here is the schedule of buses. Note that the summer service starts from 1st July and ends at the end of September. If you get the 17.30 bus summer schedule bus from Malaga airport to Marbella bus station, (45 minutes) you will be in time for the 18.30 service from Marbella bus station to La Linea bus station. Here is information about the Marbella bus station and you will find a link to the timetable of all buses out of Marbella on this page. Look for MARBELLA – LA LINEA. Again there is a later service at 20.45 if you are travelling on a Sunday. Here is the information about La Linea bus station again and you will see how close it is to the border with Gibraltar. The picture above is taken from just in front of the La Linea bus station and the border is just at the end of the row of flags. You can see a great little cafeteria to have a drink in just over the road. Please look at the two alternatives Edit and let me know if you have any difficulties with the connections or timings. Given your arrival time at Malaga airport, I think the trip through Marbella may be the best for your needs. PS: You can now do online bus ticket reservations through the gomarbella reservation system. Hi Mercedes, thank you for writing in. Your mum will need to take a taxi from the Spanish side of the border early in the morning on the day of her flight because there is not publich transport available at that time. If she takes a taxi she should leave one and a half hours for the journey. I would also try to get the airport two hours before take off so she would need to leave La Linea taxi rank next to the border at 06.30. The taxi will be around 130 euros. Hi Soren, thanks very much for writing in. It's just not possible to travel at that time of night to Gib. There's no public transport running. The only way is by taxi and that will cost around €140. Tomorrow, please check back here and I'll give you a link with all information which will help you to stay the night in Malaga, have a good evening there and then take the first bus out in the morning to La Linea bus station next to the border with Gibraltar. You can be there by 11am the next morning for a fraction of the cost. I´ll like to hear you about bus from malaga airport to Gib. I will arrive 29 sep. 22:05 and will like to go to gib right away. Is there some way to do that ? Hi Paul, if you get in at around 21.20 at Malaga airport you will be too late to catch the last bus down to La Linea de la Concepción bus station on the border with Gibraltar. Your return journey to Malaga airport will be very easy though as you have all day to take the bus from La Linea back to Malaga and then the train to the airport from the Maria Zambrano train station next to Malaga bus station. What I suggest you do when you arrive is take the C1 train from the airport into Malaga, it's an eight minute ride to Maria Zambrano train station and stay overnight in a hostel or hotel near the bus and train stations. The next day leave from Malaga bus station (right next to the train station) and bus all the way to La Linea. The first bus leaves Malaga bus station at 07.00 then the next one at 11.00. I suggest that when you get to the Maria Zambrano train station from the airport, you walk next door to the bus station and book your ticket to La Linea for the next day. Then you can go to your hotel or hostal with your ticket in your hand for the next day. There are actually five services a day from Malaga bus station to La Linea de Concepcion, on the border of Gibraltar. It takes from two and a half hours to three hours twenty five minutes depending on which bus you catch and you don't have to change buses. The cost now (2013) is €15.02 one way. Check here for booking your bus ticket online from Malaga airport to La Linea bus station. You can also book your bus ticket to La Linea online but if you have any difficulties booking online, just get your ticket at the Malaga bus station. Below is a link to the Gomarbella bus page, use the Avanzabus link at the top. Best wishes Paul and thanks for writing in. Hello Clarissa, you are such an organised traveller. Congratulations on all your planning. You are absolutely correct with your timings and routes to Tarifa. I'm afraid you can't make the Marbella to Tarifa leg anything less than semi-direct because the Costa del Sol routes and services end in Algeciras and the Cadiz bus companies take over there which means a change of bus or a short stop in Algeciras, unless you are travelling long distance all the way to Cadiz city. When your bus pulls out of the congested urban sprawl that makes up the port city of Algeciras and starts to climb the mountains on the Spanish side of the Straits of Gibraltar, you'll look back at the Rock of Gibraltar and see big tankers anchored in Algeciras bay below you and maybe an aeroplane taking off from the runway that juts into the bay. Look to your left (sit on the left of this bus) and you'll see the little white flat topped houses in Morocco and you're sure to see a ferry foaming across the straits heading for Tangiers. As you pass between hundreds of enormous spinning windmills suddenly you'll see the white beaches and blue ocean, this is Tarifa with the Atlantic stretching into the distance with nothing between you and the Americas and you'll think "Oh no, why am I only spending one day here?" Which brings me to my point, if I were you and Tarifa being one of my favourite places on earth, I would spend two nights there, the 19th and the 20th. Give yourself time to really soak up Tarifa's magic. Explore Tarifa, the castle, the boutiques, have a full breakfast at Cafe Central and see and be seen. Take a local bus or taxi to Punto Paloma beach, walk out to the point and cover yourself in green clay, have lunch at Hurricane Hotel's laid back beach cafe, watch the kites surfers, hang out on the beach with them, have midday drinks and lunch in Valdevaqueros or any of the equally laid back beach bars and listen to salsa music, find a disco or music bar for your nights. When the cruel dawn of Friday 21st comes all too soon, take a bus back to Algeciras, You’ll find the timetable on the link I have given you below. I suggest staying that night in Gibraltar rather than La Lina because it'll give you a longer look around. La Linea bless its heart is not on my list of pleasant places to spend an evening. From anywhere in Gib it's not more than 25 minutes to the frontier with Spain and only five minutes stroll to the La Linea bus station to catch your bus up to Marbella on the 22nd. When you get to La Linea on the 21st, buy your ticket for the next day back to Marbella so that you don't have to queue just before your bus is leaving. If you take the first bus of the morning out of La Linea, you'll be in Marbella before midday and in excellent time to get ready for the big night. Your blog is SO helpful as I plan my trip to Costa Del Sol. What a resource it has been! I saw an old comment on this post about travel to Tarifa and Gibraltar from Malaga airport and wanted to tap into your expertise on whether the plan I made based on your and Avanza's sites is feasible or too ambitious? I saw a bus from Marbella at 14:45 to Algeciras but I was trying to minimize the number of bus transfers and there seems to be limited options in getting to Tarifa in less than 2 transfers. After 1 day in Tarifa and 1 in Gibraltar, I have to head back to Marbella on 22-Sep for a friend's wedding. Would you recommend a Spanish side town / city that you would stay in after a day in Gibraltar that was en route back to Marbella? Or is the obvious choice of La Linea also the best choice? After the wedding, I was planning to go to Ronda and Gaucin. Would you recommend taking a bus or renting a car from Marbella? I'd love to see the old town and wineries between the area but I'm also a nervous driver in general. Hi there, interesting question that. The two bus option is only slightly cheaper but very convenient. On Sunday 3rd you would take the 16.00 bus from the airport to Marbella arriving 16.45 and then the 18.00 bus from Marbella to La Linea de la Concepcion arriving at 19.25. Five minute walk to the border followed by a ten minute taxi ride to the centre. On Monday the 4th you'd catch the 08.50 bus from La Linea to Marbella, arriving 10.20am, just missing the 10.15 bus to the airport. The next bus is at 11.30, time for a coffee at the bus station and you'd arrive at the airport at 12.15 in good time to do your check in and security. Total cost there and back on the bus, just under €35. Get your return tickets for the following day when you arrive in La Linea to save time. I checked on the Gomarbella car rental and a Ford Fiesta for one day's hire would work out at €41,45. All inclusive insurance and no great need for a GPS, straight down the A7 taking the toll road for comfort and turn off when you see the La Linea sign, Gibraltar is not signposted in Spain yet. They'll sort it out one day. Being a short hire, less than 3 days, you may or may not get a full tank, return empty clause which means you will not use about half the tank but be charged for it. You can leave the car in an overnight parking in La Linea right next to the border to save driving in. Google – Parking in La Linea, Gomarbella -for details. If you don't want to think at all, go for the bus option. If you enjoy driving and all its challenges and freedom, get the hire car. Thanks very much for writing in. About getting from La Linea bus station to Marbella check through on this link. Further down the page you'll see two links, one is "La Linea Bus Station" lots of information here and the other one is "La Linea bus schedules" Open this page and although you won't see a schedule for La Linea to Marbella, you will see times for the buses to Fuengirola and to Malaga and these buses stop in Marbella. Just say "Marbella" when you buy your ticket. About getting to Barcelona from Algeciras right next La Linea, use the Gomarbella online booking page to look at the schedule and the cost. 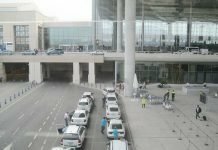 To fly to Barcelona you would have to get to Jerez de la Frontera or Malaga airports and the bus from Algeciras might just be the cheapest and simplest option. To get to Cordoba, use the above page putting Algeciras as your departure point. To get to Sevilla, if I remember correctly there are buses from La Linea direct to Sevilla and you'll get this information at the La Linea bus station. Linda, try the links and let me know how you get on. Thanks again for your contact. I will be staying right near the La Linea bus station in mid august and would like to travel further onto marbella. i havent been able to find any information like times the bus leaves, journey time and cost of bus fares to marbella….i would also like to know how the bus routes work from marbella to cordoba and seville. one final question, what is the most cost effective way of getting to barcelona from the area around the La Linea bus station. i would really appreciate your help..
Hi there, your timetable so far is excellent! 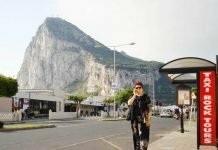 Yes, three hours will be good for a first impression for Gibraltar, a walk up the main street, perhaps a cable car to the top of the Rock and then a cup of tea on the way back to La Linea bus station. Actually the Gibraltar museum just off the main street is well worth a look and will give you a very good idea of its fascinating history. From La Linea you will take a local bus to Algeciras, about thirty minutes and then another bus to Tarifa around 45 minutes. I need to get a timetable for the Algeciras to Tarifa route so as soon as I get it, I'll let you know in detail about that last part of the journey. We've got time before you arrive. Are you staying overnight at Tarifa or travelling on? I see you are checking in from NSW. I spent 3 weeks last September travelling in QLD and loved it. Why don't you start your blog about your visit to Spain? Best wishes from Marbella and thanks for checking in from so far away. I don't know what to do after this. Please advise. Thanks for writing in. There are two ways to get to La Linea from Malaga airport. 1) Take the airport shuttle bus to Marbella and then another bus to La Linea from there. 2) Take the local L19 bus leaving every 30 minutes from the airport to Malaga bus station and then the bus all the way through to La Linea. This last bus is actually the same bus that you would catch if you went to Marbella. I suggest Option 2. You land at 13.30 so take the first L19 bus to Malaga bus station. As soon as you get to Malaga bus station there book your seat through to La Linea or book your bus ticket online with Gomarbella here. You’ll see the next bus after you get to the bus station leaves at 16.30pm so you will be in good time to book it and also have some quality shopping time in the Maria Zambrano train station (right next door) and have a meal there too in the restaurant section on the first floor. You can leave your suitcase in one of the lockers at the bus station. Don't take your eyes off it when you buy your ticket or get on or off buses. It's the same advice I give to everyone travelling anywhere so don't worry especially! Actually having said that you do see some dodgy characters around Malaga bus station now and again. I hope that helps you Bella, have a great journey and enjoy your stay. Hi, I wonder if you can help me. I am arriving at Malaga airport at 13.30 on Thursday 14th Oct. and wondered if you could recommend the best and most simple way to get to La Linea? I would very much appreciate your advice! Thanks for writing in. Malaga bus station is right next the train station. Two minute´´s walk at the most to get to the bus station ticket office. Copy this address into your browser to get the schedule of buses from Malaga bus station to Marbella and click on Malaga Bus Station. 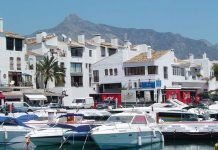 You will see that there is a Direct Service with no stops between Malaga and Marbella bus station which takes 50 minutes and a longer service which calls at Torremolinos, Benalmadena, Fuengirola and then Marbella. This bus takes 1hr. 25mins. If you would like to see a bit of the coast, take this bus, if you just want to get to Marbella in a hurry then take the Direct Service. Keep hold of your possessions at all times especially when buying your ticket or getting on and off the bus. It's summer, there are more people around and they all seem to stand a bit closer than necessary! Have a good trip to Marbella and enjoy your stay. I will be in Malaga train station on 7th august (saturday) at 14.10 and I need to go to Marbella by bus, but I didn't find any information from anybody. what are the times for buses from malaga to marbella?? how long does it take?? Hi Andrés, thanks very much for writing in. You know, if the connections look good, I think I would go for the Malaga airport to Marbella option followed by a bus to La Linea. The bus from Malaga airport to Malaga central bus station only takes 30 minutes but in the opposite direction to La Linea. Then you need to buy your ticket for La Linea and wait for that bus which will take you back past the airport (about 20 minutes) stopping in Torremolinos and Fuengirola before getting to Marbella. If the Malaga airport bus to Marbella connection is good and you don't have to wait too long for the La Linea bus, then that route will be quicker and more comfortable overall. By the way, the La Linea bus which you will get onto in Marbella is the same bus which you would have caught at the Malaga central bus station. Maybe that will help you to decide? In the winter when there are less buses to La Linea and depending on when you arrive at Malaga airport, it can make a definite difference to which way you travel but during the summer with more possibilities of buses from Malaga and Marbella there isn't really too much difference. There is a left luggage locker at Marbella bus station if you have time to break your journey and pop into Marbella but if you are pushed for time there's also a cafeteria where you can have a cold beer or two whilst you wait for the La Linea bus. Look after your luggage at all times Andrés and have a good journey. I hope this helps. Reading some of your replies I can see that from Malaga Airport to Marbella is around 45' by bus, then from there to La Linea is about 1:30hrs, so the total two bus rides are 2:15hours. The 2nd option from the airport is a bus to Malaga main bus station and then to la linea in a 3hours bus ride. Please, can you confirm that the most efficient way to La Linea is by Marbella? And how long takes the bus from the airport to Malaga bus station. Yes, that would be the most practical and cost effective way of getting to Gibraltar from Malaga airport at that time of the evening. If you google "gomarbella airport bus" you will find the bus timetable from Malaga airport to Marbella. Arriving at 9pm you will be in good time to catch the 10pm (22.00) bus to Marbella. With luck and if you only have hand luggage you might just make the 9pm bus. The bus fare varies around €4.50. If you pay the driver on the bus with a note, check your change there and then before you move off to take your seat. I have just phoned Taxisol Tel: + 34 952 774 488 the Marbella taxi company and after 10pm at night the cost to Gibraltar from the Marbella bus station is €91. Check the fare if you like before you get into the taxi although every taxi driver carries the registered fares in a book and I have never heard of any complaints. The taxi fare is only to the frontier of course and you would need to get a Gibraltar taxi from just beyond the Gib passport control into town. I am guessing but it could be around £6 perhaps a little more at that of night. I hope this helps Rachel, have a great trip and let me know how it all works out when you get back if you have time. I am arriving in Malaga just before 9pm next Friday. I need to get to Gibraltar. How would you advise I do this and, roughly, how much will it cost? I was thinking bus to Marbella then a taxi. I am very sorry not to have answered you earlier. Yes I think a hotel in Malaga the night before your flight will be the most comfortable option. The Portillo bus service won't give you enough time. A taxi from the border will cost around 130 euros and it will take at least 90 minutes. You could bus back the day before, get a good hotel for a lot less the taxi fare and enjoy a great evening out in Malaga. The weather is fantastic right now and you have chosen just the right time to travel. I have updated the schedule of buses leaving Marbella and also the buses coming back from La Linea. I have also checked on the winter schedule of the special shuttle bus service from Malaga airport to Marbella and back again and it hasn't changed. Thanks very much for writing in Jodie and I hope your friend has a good trip out and that you both have a good time together. I have a friend visiting Gibraltar for New Year. Her flight from UK lands in Malaga at 10.30 on Dec 28th. Is the information you've given before about getting a bus to Marbella and then La Linea still correct? Thanks very much for writing in. I would work on 1hr 30 minutes for the journey. A little more if you are leaving from the centre of Malaga. If you are leaving from Malaga airport then 1hr 30mins is good. This would be to the border of Gibraltar, next to the airport. I haven't phoned the taxi companies in Gibraltar or in Malaga but I would estimate about 120 euros for the journey. A little more if most of the journey takes place after 10pm. When you have decided to make the trip, let me know and I will ring one of those companies in Malaga or at Malaga airport to check for you. Let me know if I can help with any other travel possibilities but a taxi is the best way to sort out any difficulties with late arrivals or early departures from the airport. Best wishes from Marbella Michael and thanks again for writing in. Getting in to Malaga airport at 14.30 on Friday 11/6 means that if you get your luggage by 15.00 you could take the next twice hourly bus to Malaga bus station and you might just get there by 15.30 or by 16.00 at the latest. The shuttle bus to Malaga bus station from Malaga airport leaves from just outside the arrivals area at present. By the summer of 2010 there will be a fantastic new bus station at the airport. Not right now though! As soon as you get to Malaga bus station buy your onward tickets to La Linea bus station. The bus you will catch will be the 17.15 service. It's a three hour journey so your first two hours at least will be in daylight. Sit on the left of the bus for views of the sea. Malaga train station right next door is a pleasanter place to wait than the bus station and you can do a bit of shopping or have a meal in the first floor restaurant area. Keep an eye on your baggage at all times. You are absolutely correct with your timings for the return journey. A taxi from Gibraltar or from the Spanish side of the border will be the only option at that time of the morning. 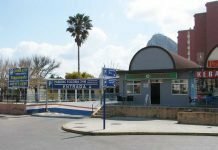 As you walk in through the frontier on your way from La Linea bus station into Gibraltar, you will see the Spanish La Linea taxi rank on your left. Check the cost of the fare as you walk in and either book the driver then and there or arrange the journey back during your stay with one of the locals in Gibraltar. Let me know if you have any questions Carmel. I hope you have a great time in Gibraltar. Best wishes from Marbella and thank you for your contact.